Our team of dental technicians and representatives are available anytime for a 30-minute online demo. 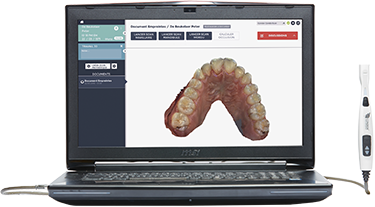 This demo covers a presentation of the Condor Intra Oral Scanner, pricing options, a live scan session, introduction to our training & support services and an interactive Q&A session. Every week, dentists from around the world visit our headquarters in Ghent, Belgium. Their tour consists of a visit to our dental clinic, where clinicians use Condor on real patients, as well as a hands-on session led by our Master Trainers. The goal of their visit is as much about getting introduced to Condor as a technology, as it is about meeting the people supporting the product. We'll be happy to welcome you at our offices. Visiting Condor felt like seeing what dentistry will be like in 10 years from now. From time to time, we enjoy the privilege of presenting our intra-oral scanner to various study groups or dental associations around the globe. During these lectures, our dentists or dental technicians showcase the Condor with a live demonstration and clinical presentation. Please feel free to reach out to invite a Condor representative to your event.